From The Barbecue! Bible, pp. 203-05. The evenings are already darker than they were at the end of August. I will have to find better lighting for the photos I’ll be taking this fall. Since I’m leaving for France on Monday, I thought I’d slow-grill one more time. Five friends shared the preparation load. 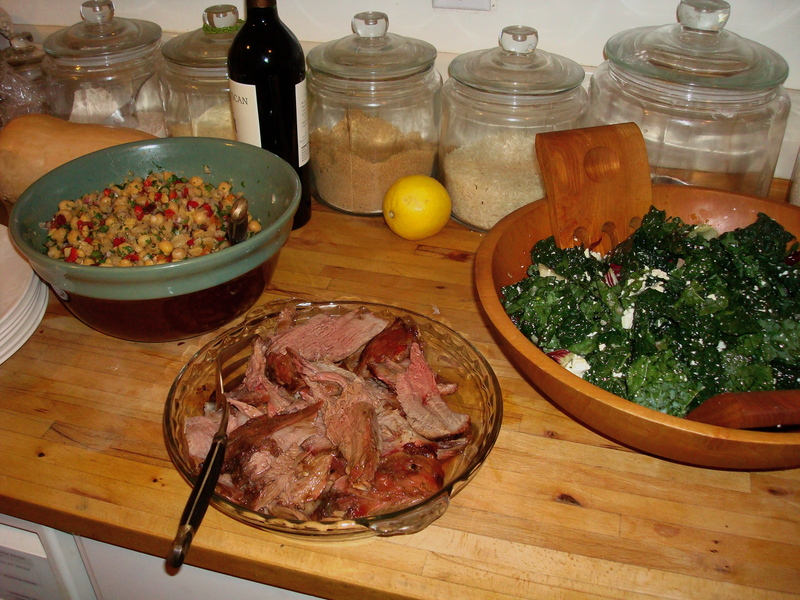 I was in charge of the leg of lamb and a lacinato kale-radicchio-ricotta salata salad. Sherry produced a delicious chickpea and ginger salad from a recipe that appeared in the NYTs last week. Rosamaria brought a lovely fruit tart. And Marilyn and John brought good wine. The ingredients in Raichlen’s recipe worried me a little. Would it be too sweet? Too hot? I needn’t have worried. The super hot mustard cooled down by the end of the grilling — although John got a big charge of horseradish from the sauce. The sweetness did not become cloying. The meat came out tender and succulent. 1. Prepare the lamb: Using the tip of a sharp paring knife, make slits about an inch deep all over the surface of the lamb. Insert a sliver each of garlic and ginger into each slit. Place the lamb in a nonreactive roasting pan and set aside while you prepare the glaze. 2. Make the glaze: Combine the Worcestershire sauce, soy sauce, brown sugar, Dijon and Chinese-style mustards, lemon juice, oil, and minced garlic and ginger in a small, heavy saucepan and bring to a boil over medium heat, stirring to dissolve the sugar. Cook the glaze until thick and syrupy, about 3 minutes, stirring frequently to prevent sticking. Remove the glaze from the heat and taste for seasoning, adding salt and pepper as necessary. Let cool to room temperature. 3. Pour half of the cooled glaze over the lamb in the roasting pan, brushing to coat it on all sides. Cover and let marinate, in the refrigerator, for 3 to 8 hours (the long the better). Refrigerate the remaining glaze, covered. 4. Set up the grill for indirect grilling, place a large drip pan in the center, and preheat the grill to medium. 5. When ready to cook, place the lamb on the hot grate over the drip pan and cover the grill. Cook the lamb until done to taste, 2 to 2 1/2 hours; when done to medium, an instant-read meat thermometer inserted in the thickest part of the leg (but not touching the bone) will register 160 F. Start brushing the lamb with the remaining glaze during the last 45 minutes of grilling; brushing it two or three times. If using a charcoal grill, you’ll need to add 10 to 12 fresh coals to each side every hour. 6. Transfer the lamb to a cutting board and brush it one last time with glaze, then let rest for 10 minutes before carving. While the lamb rests, heat any remaining glaze to serve as a sauce with the lamb. The leg of lamb I had weighted 4.5 lbs. When Raichlen recommends cutting off thin membranes on ribs and papery skins legs of lamb, like he does here (“trimmed of papery skin”), you’re thinking to yourself, “oh, it can’t really make that much of a difference.” I’ve learned that it pays to heed his advice. I’m not sure what it achieves, but I suspect that it helps dissolve the connective tissues that holds meat together and to the bone. I followed the directions for the glaze exactly and it worked well. But I marinated the lamb overnight, far longer than 8 hours. I began with about 8-10 coals on each side of the drip pan, put on the lid and waited to see how high the temperature on my oven thermometer sitting on the grate climbed before taking out or adding to them. When I put the drip pan between hot coals, I filled it halfway with water, a step that I first tried in the ribs recipe here. Did it help keep the meat moist? Probably. In any event, it didn’t hinder the cooking process. As I did in other slow-grill experiments, I put a pizza stone on the ground near the Weber grill and placed a chimney starter on it. I filled it halfway with coals, lit it, and used those to supplement the hot coals in the grill. Be careful about what is around it. You don’t want your grass to catch fire, naturally. The one serious problem I had involved my meat thermometer. I realized that it was broken. I intend to buy an instant-read thermometer when I get back from my trip, because it is essential. You cannot go wrong if you watch the temperature. The directions call for a temperature of 160 for medium. If I had had one last night, I would have taken the meat off the grill at 145 or 150 and let it rise under foil. I kept the heat inside the covered grill hovering between 300 and 350. The lamb stayed on the grill just under 2 hours. The meat was a little more than medium rare. I would have liked it a touch pinker, but I seemed to be the only one who had that wish. You’ve never eaten lamb? Try it! I admit I’ve got a couple of friends who don’t like its taste, but they are an extremely small minority. Actually, if you want a great introduction, go to the spring stew recipe posting here. I know this is an old post, but what sides would you have served with this?